Would all patrons, and everyone else, please Vote For their Top 3 out of these 4 Uncommons, 4 Rares, and 2 Mythics? These will comprise 1st-3rd place in the order of my choosing, the rest will be HMs for Season One. Voting will be from today (Monday, April 8th) until Saturday (April 13th). I'm a few days late of posting this on my birthday (April 5th), oh well! 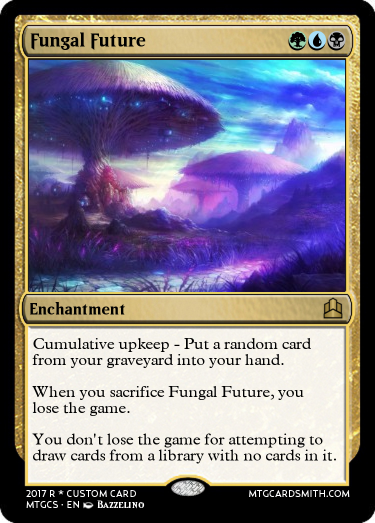 Fungal Future: "You don't lose and you do lose." - @meadowsatsunshine. Vice, Rummage Chief: "A Rakdos version of 'Group-Hug.'" - @Gelectrode. Past to Present: "A specified artwork request." - @Brainifyer. The vote order isn't important (in other words, you needn't list 1st-3rd, merely the three you like best). 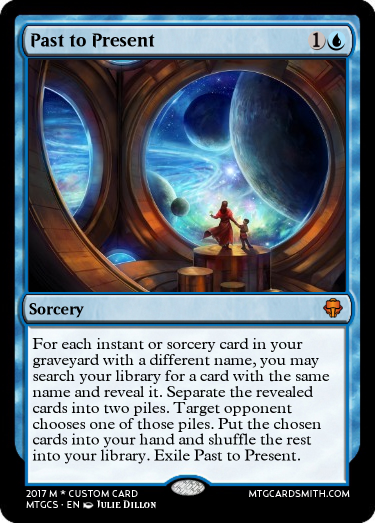 As some of you know, I only fave cards that have placed (first-third and honorable mentions) in contests I've (co)hosted: This makes "Faiths_Guide Faves" very rare. 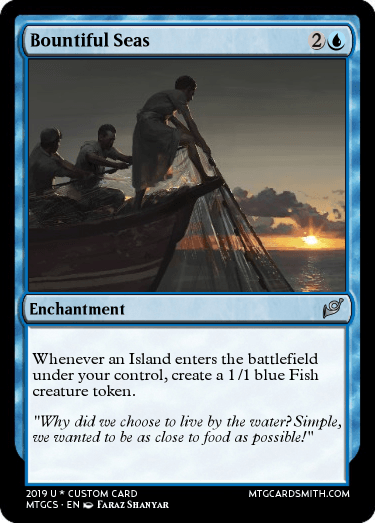 Additionally, I make tokens for those that take first place in This Set. Rewards will be announced along with results. Get those votes in before Saturday! If you are not a patron, you are still welcome to pick your top 3. I will tally all votes on Saturday (April 13th). Fungal Future, Past to Present, Magmatic Repulsion. 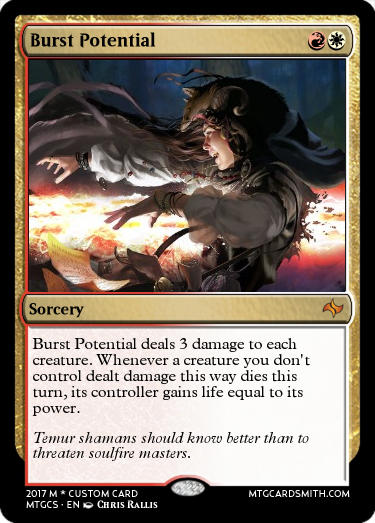 I would pick Blood Witch Aspirant for amazing combo potential and great Rakdos things, but it’s also, in my opinion, broken beyond repair. 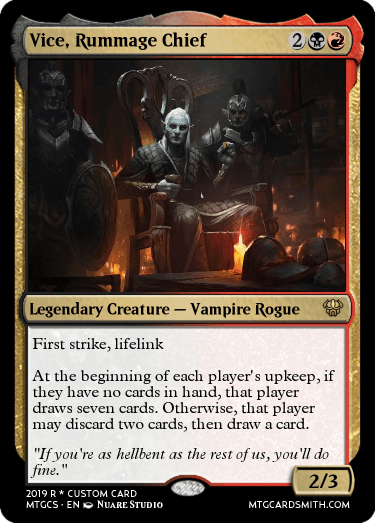 Well, it was created before he was spoiled, but War of the Spark has got an Uncommon higher power & toughness card with indentical cost and a much better version of her first ability in it: Mayhem Devil. 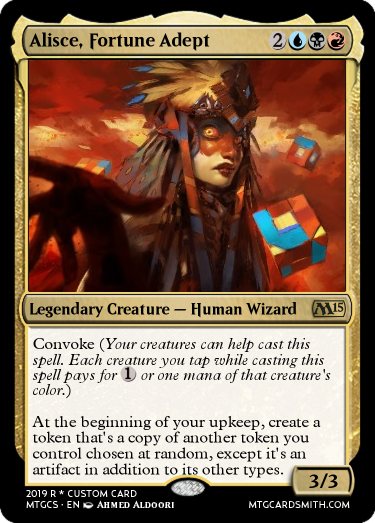 This, combined with the fact that her second ability is very restricted, and can't reduce colored mana, probably makes her too weak for rare, but I agree, she could still result in "great Rakdos things." 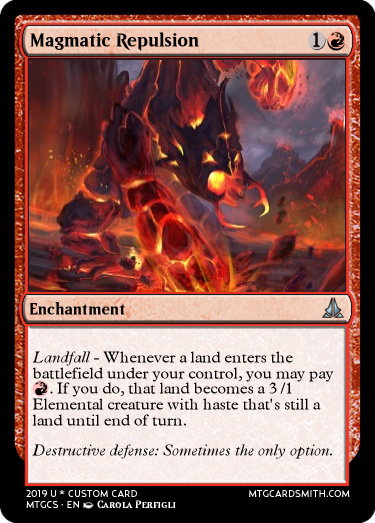 @Faiths_Guide I only say this because mana cost reduction+Dealing damage to each opponent=insane spectacle things. Also, isn't Mayhem Devil a 1 hit kill with Bolas Citadel? 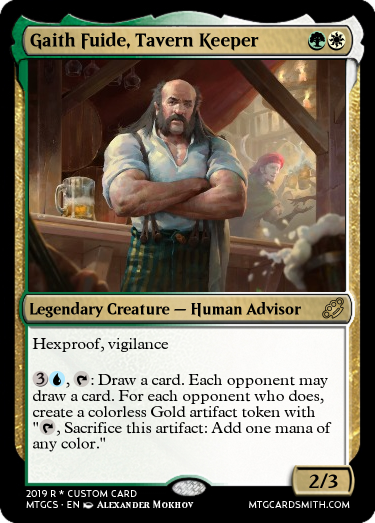 That card seems pretty op, especially in an aristocrat based deck, and especially at uncommon. Both are reallllyy good, actually. Well, you do have to have 10 nonland permanents in play. The devil isn't really op, just good. Correct, they are both really strong. It's cool that you noticed the spectacle synergy (I designed for that). I have now linked the restaurant above. Fungal Future, Burst Potential, Magmatic Repulsion. 2. 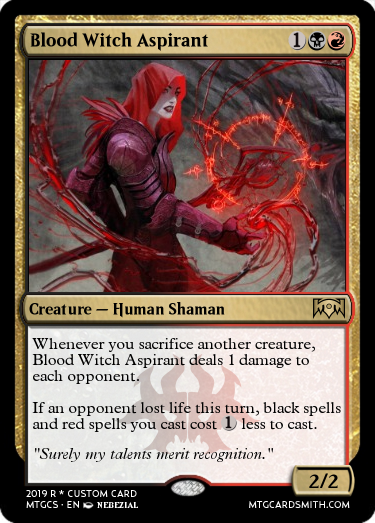 Blood Witch Aspirant - It feels RTRTR and I love it! 3. 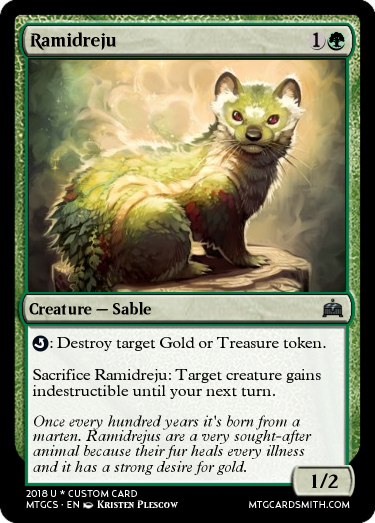 Ramidreju - Cool new creature and flavorful to boot! You've caught me at a busy moment I'm afraid, but both ale and advise are for sale at a price. So now you know the truth, the restaurant is but a dense wooden tavern. At least the food's good, am I right? @Faiths_Guide forgive my ignorance, but how do you become a patron...? Is this contest based on a contest I missed? What is this exactly? Visit "The Restaurant" link in the description to find out more! Happy belated birthday fg! I saw your reverse contest before, i thought i made a request but i guess i must not have posted it? Just scanned the discussion: it would appear that you've never commented over there. so, how do I get involved, do I still go to that one or do I post a request here for you? Or is it too late? Sounds tough, only ten words...ok thanks. Anyone is welcome to vote on their top 3 of the ten cards in the description. *Buoomp* Excuse me! Eating to much of my own cookin' again! 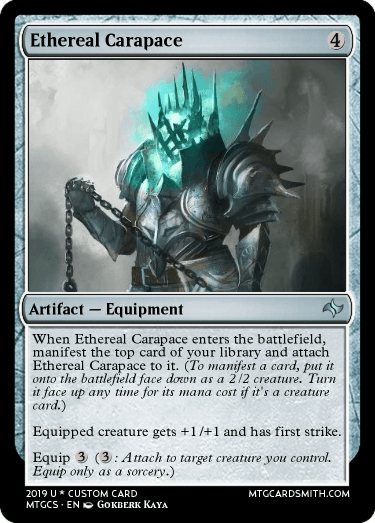 Ramidreju, Burst Potential, Ethereal Carapace. Loved the menu, will come back for more. Reminder: Tomorrow is that last day to cast your vote!